From Bowie to Zappa, Kinderhook resident Richard Boch recalls memories of the madcap downtown scene. Richard Boch’s life was never the same after he began working the door at the Mudd Club in 1978. The Tribeca club — frequented by Mick Jagger, Iggy Pop, David Bowie, Frank Zappa and Andy Warhol — introduced him to a world of seductive possibilities and the potential for self destruction. Decades later, vivid memories of that downtown scene inspired Boch to write his memoir, The Mudd Club. Writing the book — and gathering dozens of photographs — took seven years, more than three times the amount of time Boch worked at the club. Little documentation existed, so Boch drew on his memories and conducted interviews to nail down the book’s minutiae. As the club’s “gatekeeper” Boch decided who got in the door and he often got to party with some of his personal idols. The Mudd Club was possible, said Boch, because it existed in another New York City, a city all the more attractive for its rough edges; a place where affordable real estate made it possible for young artists to live in and pursue their dreams. When Boch ruled the ropes at 77 White Street, there was no formula for getting in; just his gut feeling as to who would fit. To gain entry customers might slip Boch some cocaine inside a roll of cash and inside there were more drugs to sample. When Boch wrote his tell-all he was careful only to tell on those whose exploits were already legendary. Getting high became a dangerous habit for Boch and eventually prompted him to quit the scene. While working nights at the club, Boch continued to paint, inspired by abstract artists such as Robert Motherwell, graphic artists such as Warhol, and Ed Ruscha, who was putting words on paintings. Boch, who now divides his time between city events, such as fashion shows and gallery openings, and a quiet life in Kinderhook, still creates what he calls “page paintings” and is currently discussing a 2019 show of his work in Hudson. Recent paintings include words from his book. He also stages club nights once a month at the Soho Grand Hotel club room, featuring well known DJs such as former Talking Heads drummer Chris Frantz. As well as archiving his Mudd Club book resources, Boch is also planning a new book about “sexual misadventures in clubland.” It will focus on the 60s and 70s. 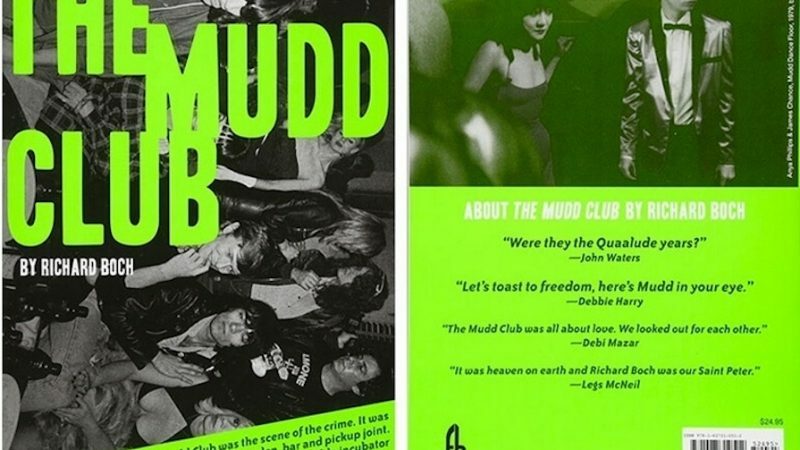 He wraps up a year of promoting the Mudd Club book with a talk and slide show at 3 p.m. Sept. 23 at the Kingston Artist Collective and Cafe, at 63 Broadway. Boch also hopes his Mudd Club book will become a TV series, documenting the time.